As the mystery enters another stage with more clues and people involved, it’s not an easy detective game anymore for Chae-Yoon to solve. One of the things I’m looking forward is the moment So-Yi will recognize Ddol-Bok, and Chae-Yoon get to know about Dam-Yi who is still alive. It won’t be an easy path for them to be able to recognize each other back, but I’m wishing these childhood friends will be reunited, and ends the wretched fate they faced when they were younger. The guards quickly tear Chae-Yoon from So-Yi, who is later carried away by the court ladies. His scream makes Moo-Hyul realizes that he’s the same boy he rescued under Sejong’s order. For So-Yi, Ddol-Bok’s scream becomes her nightmare and the pouch with his name is the one that can her comfort and ease of mind. Chae-Yoon goes over to meet So-Yi but he’s blocked by two court ladies, saying that she’s not recovered yet. He doesn’t believe it when they say So-Yi can’t speak, so he asks to verify it. So-Yi hears all of this and comes out. 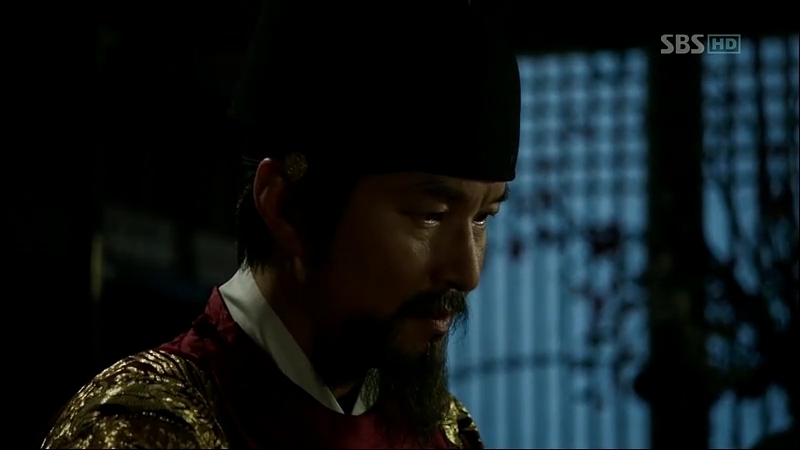 Sejong is deadly upset about the scholar’s death, the third murder happened in row. Instead of going back to rest, he meets the ministers and discusses with them about the events happened. He expresses how upset he is about the death and urges the ministers to take immediate actions to catch the intruder. Chae-Yoon starts his interrogation session with So-Yi and starts to ask about what she was doing at the office. She avoids answering the questions directly and tells him to only ask things associated with the case. 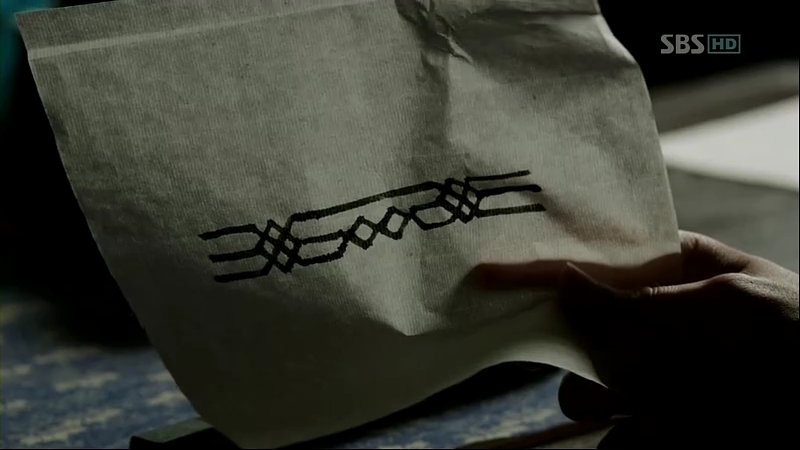 So-Yi draws a complex pattern that she saw on the intruder’s iron brace. Chae-Yoon doesn’t believe that she’s able to remember such a complex pattern through a single glance and So-Yi proves her talent to him. She writes the all the names she saw on the board when she entered the guard office perfectly and that makes Chae-Yoon amazed. Suddenly, Prince Gwangpyeong comes over and brings her away, thus concluding the session. Chae-Yoon is still not satisfied with it and proceeds to the printing office, which is completely burnt. Ga Ri-On is examining Yoon-Pil’s corpse and again, he can’t find any wounds on it. He explains to Chae-Yoon that he might have to check his lungs to look if he died from the fire smoke. Chae-Yoon suspects that the murders might have a connection with the elements: earth (Go In-Seol), water (Heo Dam), and now, fire (Yoon-Pil). Ri-On looks at him suspiciously and he’s surprised to see Chae-Yoon also knows about water involved in the previous murder. 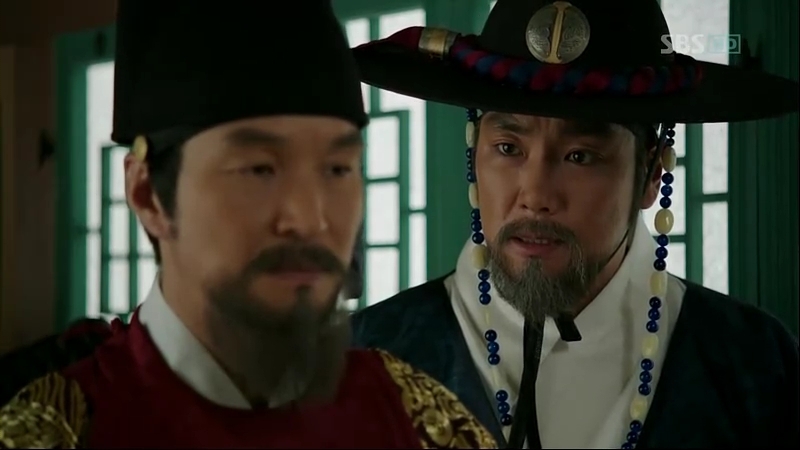 Officer Jeong comes over and tells Chae-Yoon to see King Sejong at his private quarters as he wants to meet him. Chae-Yoon is surprised about the idea of Sejong asking to see him. Moo-Hyul is still thinking about Chae-Yoon/Ddol-Bok and he doesn’t have a good feeling about Chae-Yoon’s wish to have a drink with Sejong. 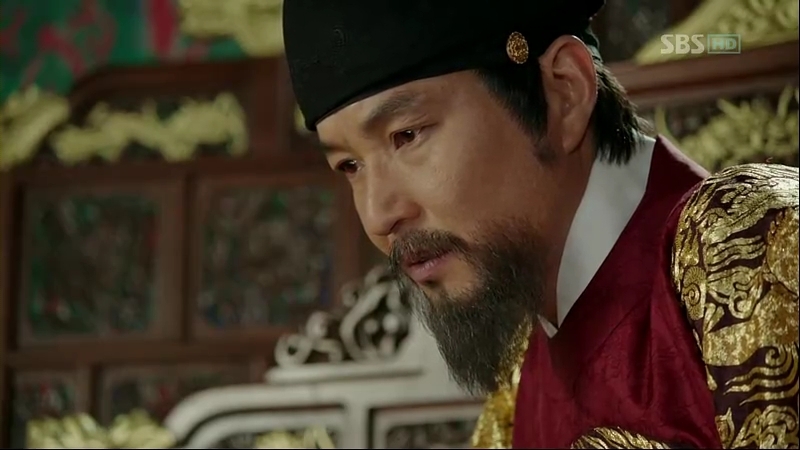 He decides to take this matter in his own hands and tells his assistant to bring Chae-Yoon outside the palace secretly. 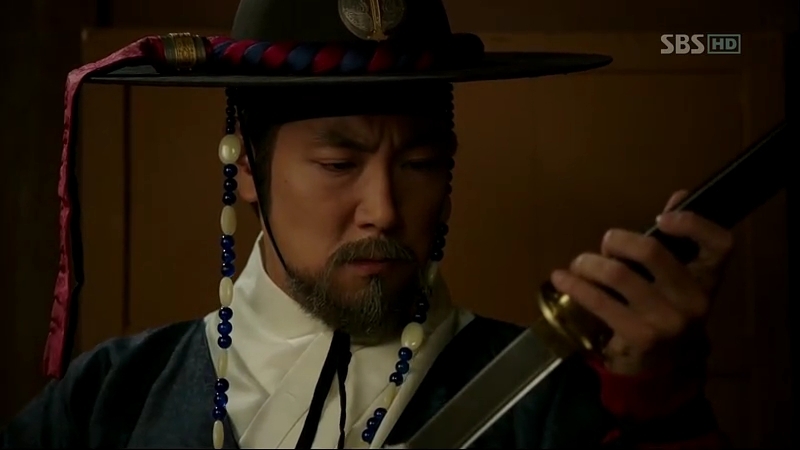 However, he’s a step too late: Chae-Yoon is already on his way to meet Sejong, preparing his knife. Sejong asks Chae-Yoon about the incident and he would like to know how he’s able to track the intruder. Sensing that this is his chance, Chae-Yoon demonstrates the movement, and he’s ready to launch himself at Sejong when Moo-Hyul arrives (Thank God he’s always fast). 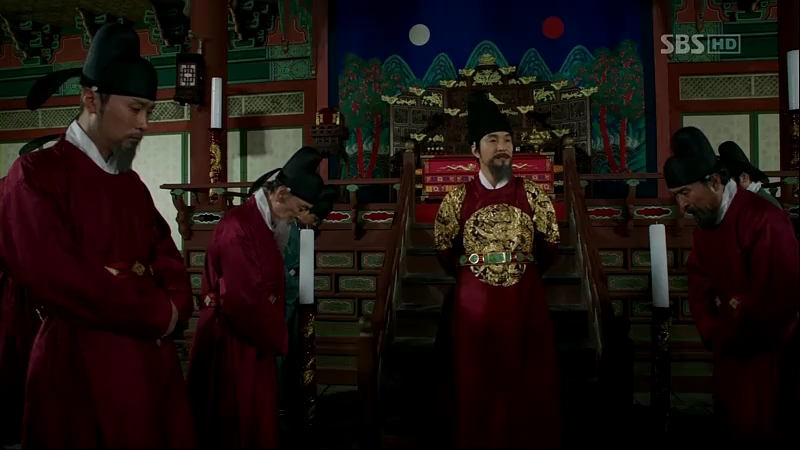 Moo-Hyul chides Chae-Yoon for displaying a manner not befitting the great hall and Chae-Yoon bows back while explaining it to Sejong. He walks out, still regretting the chance that went away so fast. 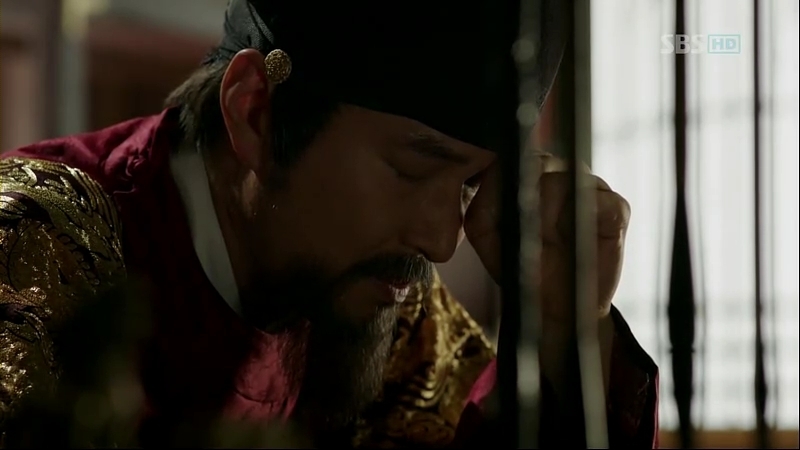 He holds himself and thinks that he’ll have better chance to kill Sejong during the royal drinking session. Moo-Hyul tells the truth about Chae-Yoon identity to Sejong. 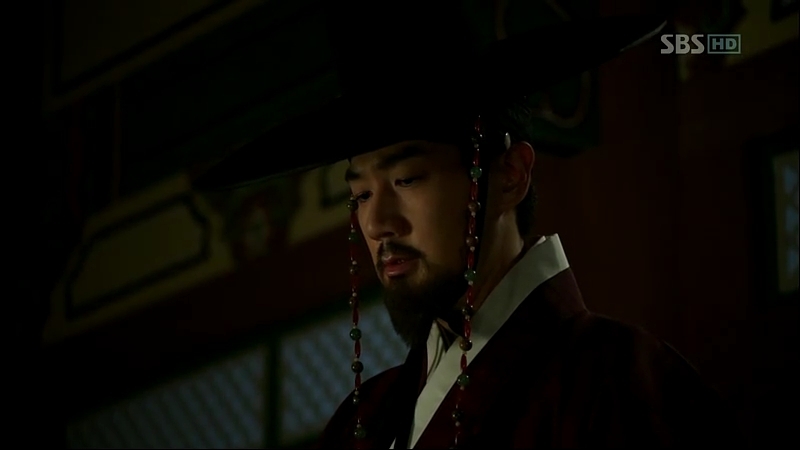 He explains the guy’s strong will to come to the palace with a sole reason: to kill his father’s murderer, Sejong. He wants to deal with this personally, probably by killing him silently, but Sejong doesn’t allow him to do so, yet. Sejong is still disturbed by his guilty conscience that Ddol-Bok’s family was gone because of him, and decides to give more thought on this issue. Back to his past, Sejong was attacked with a pebble aimed at him. 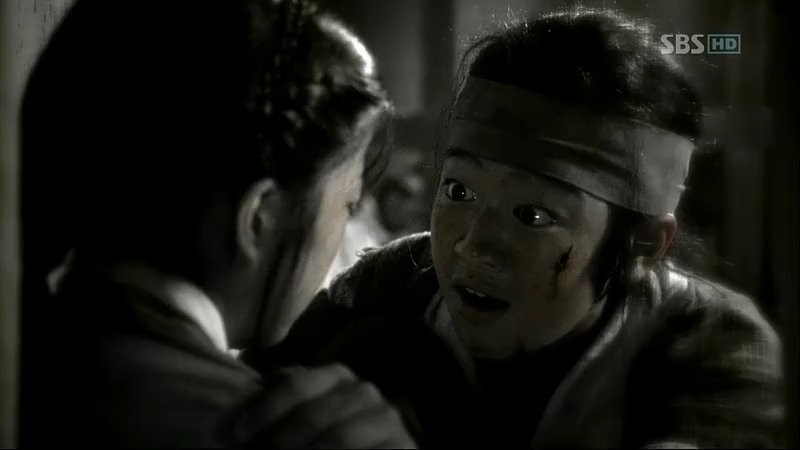 It’s the little Dam-Yi’s doing and the guard held his sword to her neck, but Sejong told him not to do anything. He asked her the reason she did that to him but got no reply from her. Queen Soheon came over and explained about Dam-Yi’s inability to speak as a result of the traumatic experience she had from the Shim clan’s massacre, which also killed her family. Sejong approached the little girl and apologized to her, tears rolling down his cheeks. The memory vanishes when Sejong arrives at Prince Gwangpyeong’s quarters to meet So-Yi. She gives him what she got from the dead scholar but Sejong is still absorbed in his thinking about the murders. He blames himself for every murder that’s happening and believes that he should be the one to be held responsibility for everything that happens in Joseon as he’s the king. He gets furious when So-Yi tells him that it’s not his responsibility. She writes the sentence over and over again, and Sejong pushes the paper away each time she does that. Unable to hold himself anymore, he collapses on his knees, crying. So-Yi, tears streaming down her face, tries to wipe off his tears, but he doesn’t let her to. He tells her not to cry for him and not to be easily shaken, for he’ll collapse if she does so. 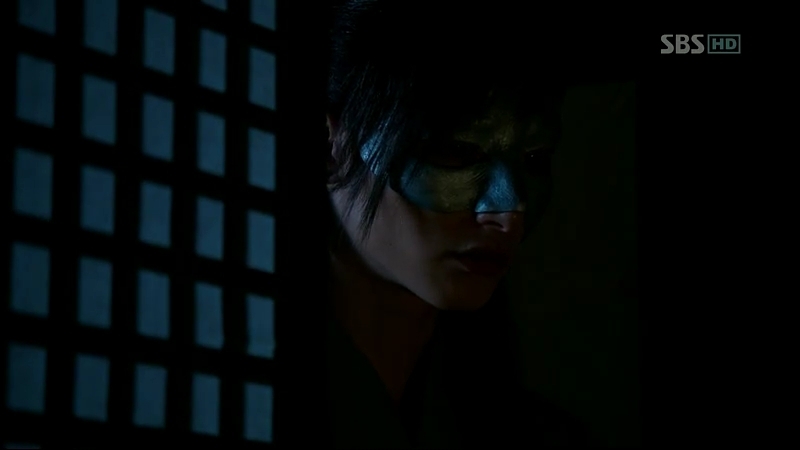 Sejong walks away, thinking about Ddol-Bok, whom So-Yi missed so much from her childhood as Dam-Yi, who has come to kill him. The autopsy on Yoon-Pil’s body finds something stuck in his throat: some print blocks that he might have swallowed just before his death. Chae-Yoon and Cho-Tak also found something: a mark near the corpse’s heel. 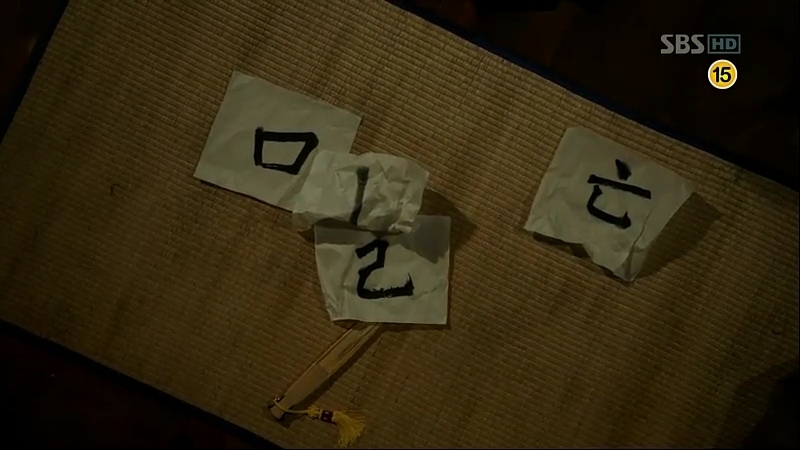 Thinking that the blocks with the characters might be his last words and a possible clue, Ri-On informs it to Sejong. Sejong’s face changes when after he looks at the characters and tells Ri-On not to disclose this matter to anyone, but he’s unable to do so as a man whom Chae-Yoon asks to decipher the meaning has told other people about it. Do Dam-Daek also overhears him. Seong Sam-Moon goes over to Jip-Hyun Jeon to tell the other scholars about the characters. Chae-Yoon explains his reason for intentionally spreading the clue so that someone will solve it for them. Right now, he’s curious about the mark he found, which was also found on Heo Dam, the scholar who died before this. His theory is they might come from some sort of organization. 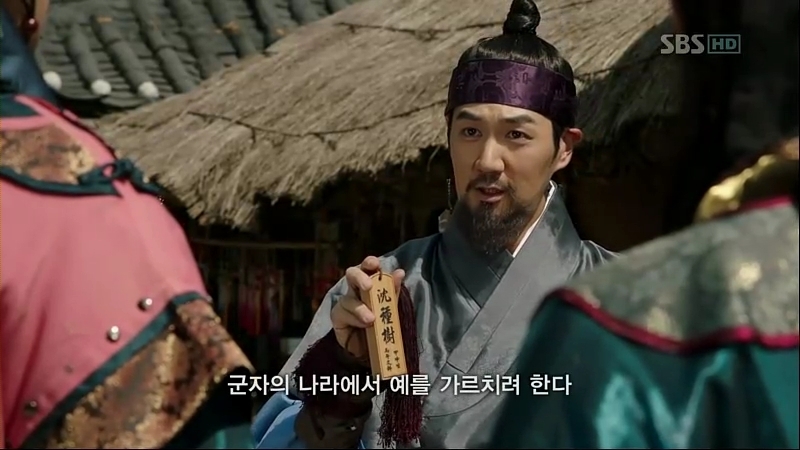 Moo-Hyul urges Sejong to take action as soon as possible because he worries about Sejong’s safety. Sejong then remembers Ri-On’s report about Chae-Yoon, who seems to know everything associated with the murder, exceeding Sejong’s expectations on him. So-Yi asks him whether he knows about the meaning as he doesn’t even try to solve it and he admits so, only that he can’t believe it. Chae-Yoon and Cho-Tak, on their way to Jip-Hyun Jeon, encounter some people from Ming who are disturbing the commoners but to avoid any problem, they stay out of it. However, a man comes and stops the Ming people. He introduces himself as Shim Jong-Soo (Han Sang-Jin) and defeats all of them. A woman comes and apologizes to him for her men’s behavior and walks away. The scholars are busy discussing about the characters when Chae-Yoon and Cho-Tak arrives at Jip-Hyun Jeon. They are rather surprised to see the Assistant Chief Scholar Shim is the same person fighting off the Ming people on the streets earlier. Chae-Yoon requests for a body inspection on all the scholars but he is turned down by the Chief Scholar Choi Man-Ri, who then chases the two guards out angrily. While Jo Mal-Saeng is busy threatening the guards to show where Yoon-Pil’s corpse is, the scholars are busy solving the characters’ secret. Chae-Yoon and Park Po are spying people’s movement in and out of Jip-Hyun Jeon when Cho-Tak comes to report about the corpses that suddenly disappear. Do Dam-Daek and the masked man are also in dark about who moved the corpses but she could guess it’s someone related to the dead scholars. It turns out that Sam-Moon and Paeng-Nyeon who order a man to do it in order to personally look at them. Dam-Daek doesn’t want to let the matter goes off easily and tells the man to investigate about it. After the masked man leaves, she is again visited by the mystery man. The mystery man is actually Scholar Shim. He tries to solve the meaning behind the characters. Minister Jeong In-Ji asks Sejong about the meaning and Sejong shows him, saying that only eight persons know the meaning behind it. Paeng-Nyeon and Sam-Moon finally find the mark on the corpses, the same mark they have as members of an organization named Heaven and Earth (Cheonji). They wonder about how much Sejong is involved in this matter. Scholar Shim yells in frustration when he discovers the real meaning behind the characters that annoys him: “the perished Mil”. The characters which are thought to be Hanja actually read another thing in Hangul when re-arranged. 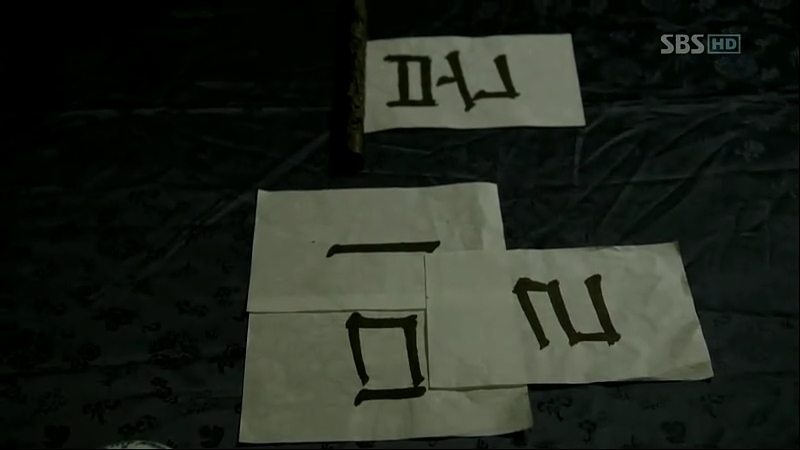 Sejong writes something derived from the last character left after the ‘mil’ has been constructed. He reads the word between his clenched teeth. The new arrangement reads “Mil-Bon”. This show really know how to make your feelings go on a roller coaster ride. At one time you’re feeling so nervous until your palms sweat, but after that, you unconsciously shedding tears. People with heart problem shouldn’t be watching this. Not to discourage anyone, but this is a friendly advice.It’s full of surprises and you’ll never know when you’ll jump in shock. Sejong’s breakdown is so heart wrenching. No matter how powerful, brilliant, and wise he is as a King, he’s still a human. Being himself only in front of few people, one of them is So-Yi, he shows how soft-hearted he is. For now, I’m believing his affection that he has towards So-Yi is purely driven by his guilty conscience towards her and hopefully he’ll not fall in love with her. I still love his relationship he had with Queen Soheon, which was rather lovely. There is one thing that confuses me. Why are Moohyul and Sejong afraid of Soyi finding out that Chaeyoon aka Ddolbok is still alive?? When Moohyul tries to convince Sejong that Chaeyoon should be killed, Moohyul warns Sejong about what could happen once Soyi finds out that Ddolbok is still alive, and that frightens Sejong. Why, I wonder? Is it because she’ll leave the palace court to be with Chaeyoon and then they’ll lose a valuable, skilled helper?? That doesn’t sound like a likely reason. Sejong can’t be worried that Soyi will find out the truth about her father and Ddolbok’s father’s deaths, because she already knows that Sejong is somewhat responsible for that. When she was little, she threw a rock at him. But they have since reconciled. A part of me wonders why Sejong doesn’t want Soyi to find out that Chaeyoon is Ddolbok when he knows how much she misses and loves him. Is it possible that Sejong has some romantic feelings for her?? I know he has a very noble character in this drama, and does seem like he has a platonic relationship with Soyi. However, I read somewhere else that he had A LOT of sons in real life, which meant that he procreated with a lot of court ladies. I wonder if his relationship with Soyi might be slightly alluding to the other, real dimensions of his character. Also, I wonder what was written in Chaeyoon’s father’s will. Oh yeah, and I wonder why Soyi (as a young girl) read the letter sent from Sejong to the Queen’s father incorrectly? 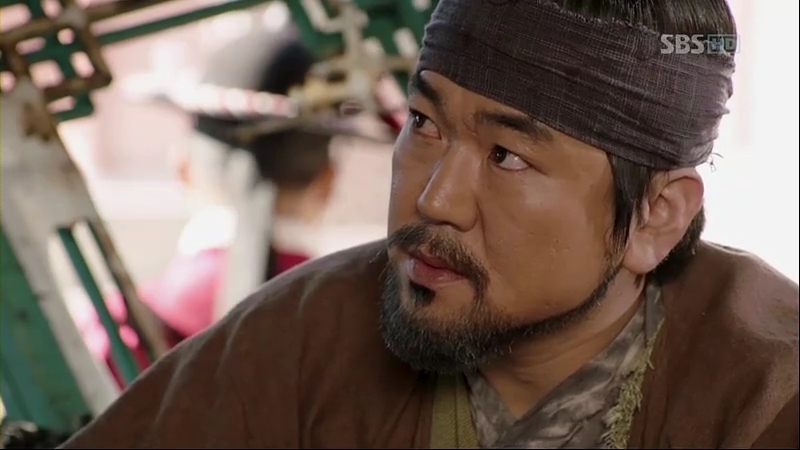 I’m also still a little bit fuzzy on why Chaeyoon thinks that Sejong was responsible for his father’s death. All Sejong did was give the letter to the palace girl, who then gave the letter to Chaeyoon’s father, who then was executed for delivering to the Queen’s father. 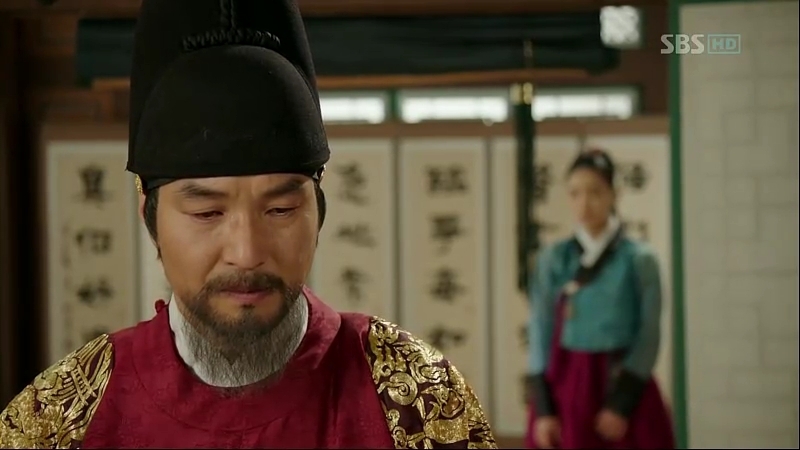 Yeah, Chaeyoon’s father would never have died if he didn’t deliver the letter, but it still seems like Taejong/Jo Malsaeng is more responsible for Chaeyoon’s father’s death since he was the one that ordered the Queen’s father to be executed, which led to the royal troops killing Chayeoon’s father for helping the Queen’s father. Is Chaeyoon misguided because he never got to read the contents of his father’s will?? There must be a resolution between the two somewhere in this drama, since Sejong wasn’t assassinated and because I think Chaeyoon will help Sejong, not Milbon. I’m so curious as to how this drama will turn out. Because I think there are a lot of misunderstandings and once those are cleared up, a lot of the problems will also be resolved. After all, it seems that Sejong and Milbon are after the same goals, improving the lives of the common people. 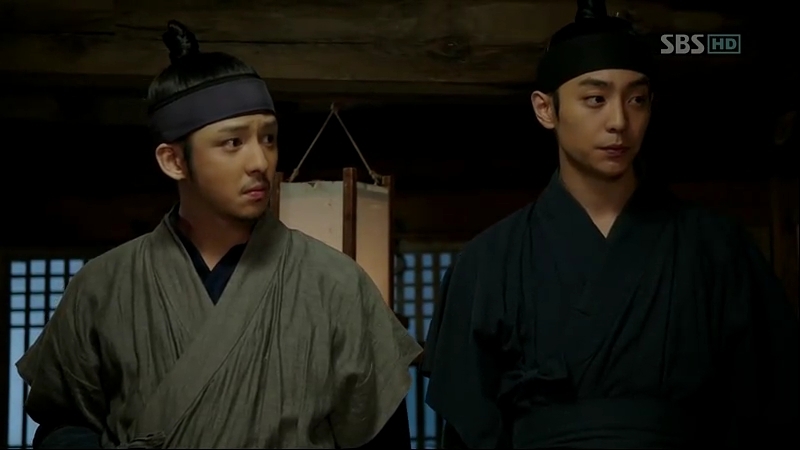 I think Sejong is afraid to tell So-Yi about Ddol-Bok/Chae-Yoon because he’ll lose one of his most trusted people in the palace. according to the early synopsis, So-Yi is also one of the people behind Hangul creation. Sejong isn’t only afraid to lose her in sense of a helper, but also as a human. Looking at how he could cry in front of her in his position as a king, surely she’s someone important to him, right? only we don’t know if he does have any feelings towards her. When Shim clan was all killed, they were still young. So-Yi/ Dam-Yi sensed something was not right when she read that letter (in ep 1) but as the little court lady said that the letter was from the King, she didn’t dare to say anything. Chae-Yoon/Ddol-Bok also heard that it’s the king that ordered them to send the letter to Lord Shim On, so basically, to him, it’s the king that sent his father to death. From his point of view, as a small boy who didn’t have any knowledge about what the hell was going on inside the palace, he just went with what he knew: the source of it was from the king, which was Sejong, at that time. 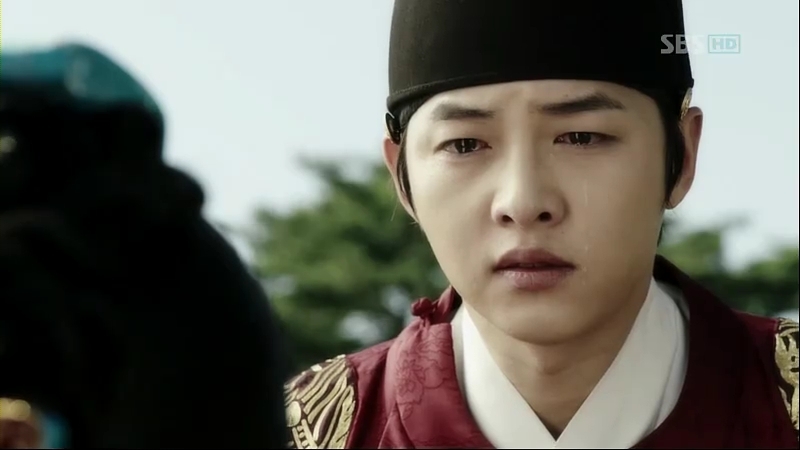 Hence, he blamed Sejong for what happened to him and his father. I think So-Yi would find out about him eventually, and since she lived in the palace and close with Sejong, she might be the one who’ll explain all of it to Chae-Yoon, thus making him realize the truth behind the things that happened.